Back in August one of my favorite podcasters, Casey Liss, had his iPad home screen featured on MacSparky and I realized lots of people (tech celebs and pros) have had their iPhone and/or iPad home screens featured on either MacSparky or another site called The Sweet Setup. 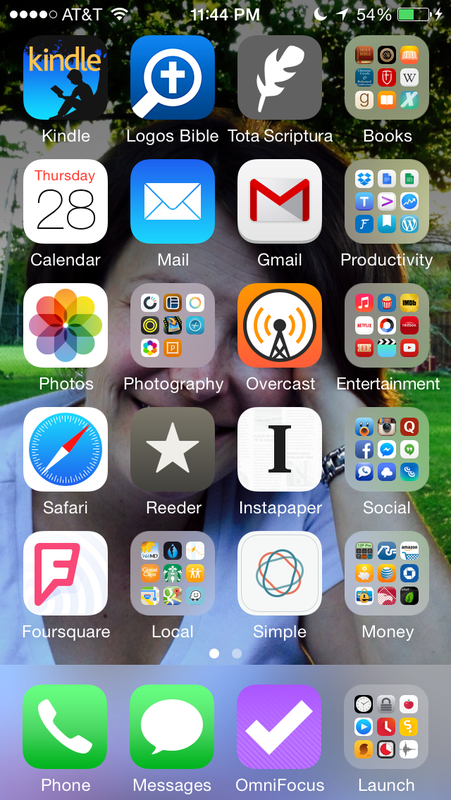 I recently refactored my iPhone into a single home screen, and I’m quite proud of it, so I thought I’d show it off and hopefully introduce you to a few apps you’ve never heard of and may find useful. As I mentioned, I recently refactored to a single screen setup1. I have everything roughly grouped into categories: reading on the top row, productivity on the second row, photography and entertainment on the middle row, web and social media on the fourth row, local and money on the bottom row. I keep my most-used apps in each of these categories out on the home screen, and the rest in folders. Since a year ago with iOS 7, you can now keep an unlimited number of apps in folders. Many of my folders are three pages long and at least one is four pages long. The most used apps in each folder are on the first page of the folder, and my long tail of lesser-used apps is tucked away deep inside these folders. When I’m looking for one of these long-tail apps, I typically pull down Spotlight and launch it that way rather than go digging. Having everything on the first page may seem cluttered, but it actually means fewer taps of the home button to get all the way back out. When I come out of an app that is in a folder, I can tap one more time to get to my home screen, whereas, if I were in a second- or third-screen folder, I might have to hit the home button two more times to get to the first screen. I’m nothing if not efficient (read: lazy). Apps I couldn’t live without: Kindle (books), Logos (Bible), OmniFocus (getting things done), and Overcast (podcasts). Apps I love: ComiXology (comicbooks), Dark Sky (weather), Instapaper (read later service), Picturelife (cloud photo storage), Reeder (feed reader), Simple (banking), Soulver (calculator), Textastic (web development), and Tweetbot (Twitter client). Questions about any other icons you see in the screenshot? Know an awesome app I’m missing? Drop me a line on Twitter or Facebook or toss in a comment below. This entry was posted in essay and tagged apps, casey liss, comixology, dark sky, instapaper, iphone, kindle, logos, macsparky, omnifocus, overcast, picturelife, reeder, simple, soulver, textastic, the sweet setup, tweetbot. ‹ How do you use social networks?